Those of us who own homes know that in order to maintain a healthy, beautiful garden, it is necessary to use mulch both before planting and afterwards on a periodic basis. This is because mulch keeps moisture in your soil, which saves you water, and it prevents weeds from growing (how well depends on the type used). Mulch also adds a finishing aesthetic touch to your garden, giving it the curb appeal we all want, which truly does make it a crucial component of any well-maintained garden. However, one of the most common issues with mulch is that it discolors when it ages and most mulches usually wash away easily in heavy rains. Luckily, I’ve discovered a wonder product that holds up much better over time and makes it much easier for me to maintain a thriving garden. It’s called Softscape mulch, and it’s a vast improvement over the most basic mulch, Pine Straw, which is one of the most classic types of mulch that is also still one of the most popular. 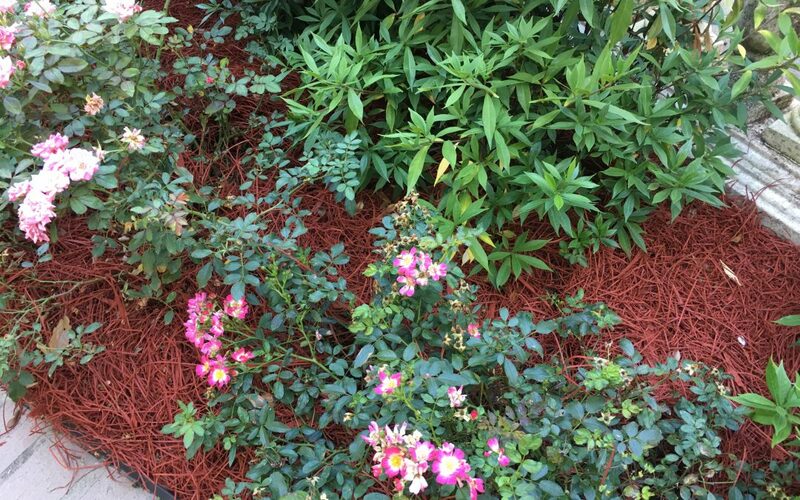 Here’s why you should consider investing in Softscape mulch instead of Pine Straw the next time you set about planting your garden. A photograph of Sienna Softscape Mulch at work. One of the most appealing characteristics of Pine Straw is its low price. Landscapers buy Pine Straw by the bundle, but for homeowners, it usually comes out to about $5-$6 a bag to purchase, plus $2 extra per bag for installation, if you’re using a landscaper. This means that at the low price of approximately $8 a bag, you can have Pine Straw mulch professionally installed. That said, most people still choose to install their mulch themselves, as the process is not terribly difficult to carry out (just remember to wear gloves). For the past few years, however, I have been using Softscape mulch, and I much prefer it for a variety of reasons. Softscape mulch has a stringy, distinctive look with a rich pigment that really lasts, and it comes in a variety of colors ranging from deep red to yellow, some of which look 100% natural (I, myself, am partial to the Sienna color). While it is a more expensive mulch than Pine Straw, at about $8 per bag and the same $2 installation price per bag, this mulch is specially formulated to last about 2 years. So, while the upfront cost for Softscape might be higher, you won’t be spending money on mulch every 6 months, which means you’ll be saving money over time. This mulch is also dyed using “natural” methods, so the color lasts much longer than all natural mulch, keeping your garden looking lush for a longer time. It’s worth noting that I am not 100% sure about the type of dyes used in Softscape, so I would avoid using it around your edibles without further research, but my flowers and shrubs are unaffected by these dyes. Another benefit of Softscape is that it does not wash away as easily as Pine Straw does. With a heavy rain and some pooling water, Pine Straw will wash away in the blink of an eye, whereas Softscape will stay put. In fact, I have a vivid memory of sitting in my window during a heavy rainstorm, watching my Pine Straw wash away and asking myself why I didn’t use the Softscape. After switching the same beds to Softscape, they are full of mulch and immune to heavy rains. Finally, beyond its aesthetic advantages, Softscape also does a much better job of keeping weeds down than any other mulch I have used. This perk will save you, and your back, from having to do labor-intensive weeding after work or on weekends. So, in closing, while the initial cost of Softscape mulch might be a little higher, investing in this type of mulch will save you money, energy and effort in the long run. With fewer applications necessary, stronger staying power, and color that lasts much longer, Softscape mulch is my top pick for best mulch that is readily available for purchase by homeowners. Consider making the investment in Softscape the next time you’re in the market for mulch – and remember, no matter what kind of mulch you choose to purchase, ask to buy it in bulk, as garden centers will offer more discounts the more you buy!